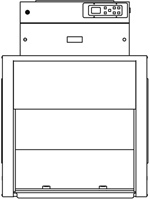 The Purair® ECO Series ductless fume cupboards are high designed to protect the user and the environment from hazardous vapors generated on the work surface. Central to the ECO Series design is the innovative Multiplex™ Filtration Technology and the Air Science exclusive EFT™ Enhanced Filtration Technology developed to assure universal protection in the work environment over the widest range of applications in the industry. Purair ECO cabinets are available with the optional ECOair controller with an open-source BACnet networking protocol for seamless integration with a multitude of building automation and supervisory control, alarm and monitoring functions. 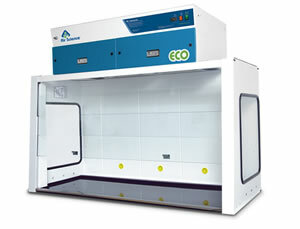 Purair ECO cabinets are available in five standard sizes, in metal or optional polypropylene construction. 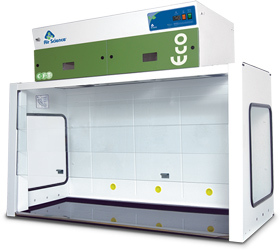 A high capacity air handling system delivers face velocity of 100 FPM. 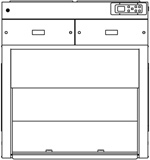 The ECOair™ Controller manages all local cabinet functions, set points and alarms. The BACnet operating system is based on a non-proprietary, open source platform for seamless integration with a building management and supervisory protocol. A. Filter I.D. Window: A strategically placed front cover window shows the installed filter part number and installation date; encourages timely filter replacement. B. Tempered Glass Side Walls: Clear side panels allow ambient light into the work area and provide a less obstructed view of the work surface. 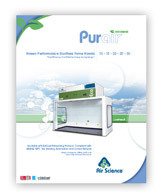 Purair ECO-20, shown with optional Mobile Base, Modular Utility Package and ECOair touchpad controller. C. Tempered Glass Siding Sash: When closed, the cabinet sash isolates the air within and protects interior work items from inadvertent external contact. D. Spillage Tray: A black polypropylene spillage tray is removable for easy cleaning. 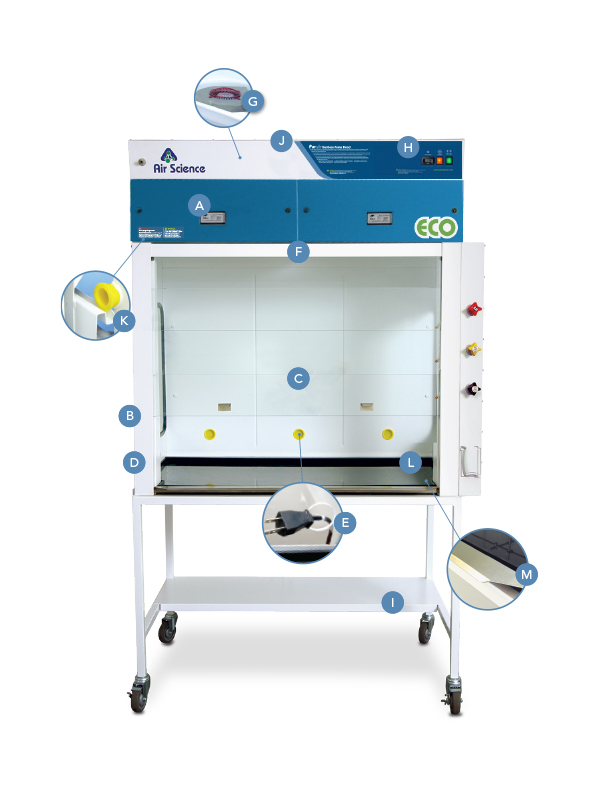 E. ECOair™ Touchpad Control Panel (shown): Security access color touch screen controller for set point, monitoring parameters and all operational and safety features. F. Steel Support Frame: Chemical resistant coating. G. Electrostatic Pre-Filter: 95.5% effective pre-filter, accessible from inside the work area to contain the release of any trapped particulates. H. Pass-Thru Ports: For routing electrical cords and instrumentation leads as required. I. Dynamic Filtration Chamber: Prevents any possible leakage of contaminated air by pressurizing the fan plenum (positive air) and depressurizing the filter compartment (negative air). K. Safety Filter: Optional carbon or HEPA/ULPA safety filter adds additional protection. L. Track and Wheel system: Permits the filter wheels to glide into place on tracks before clamping tightly to the filter gasket; prevents damage during installation and assures filter integrity. M. Modular Utility Package (Optional). N. Ergonomic Arm Rest: An ergonomic arm rest improves user comfort and productivity. Smooth Sash Operation: The chain drive sash mechanism is quieter and smoother to operate than conventional counterbalanced design. Sash Options: Manual sliding sash, standard. Optional motorized sliding sash or manual hinged sash are available; see accessories. Power Supply: Operates on standard 120V, 60Hz, 1 phase power; other voltages available upon request. Electronic Gas Detection System: Increases safety, provides four methods for filter monitoring and gas detection.